StoryBundle is also introducing two new features alongside the Holiday Gift Bundle that make gifting books supremely easy: Gift Cards and timed delivery. Gift cards are a new feature we added for the Holiday Gift Bundle that allow you to send someone a code that they can redeem for any future StoryBundle bundle! When someone receives a gift card, they can keep the code (codes never expire) and decide for themselves when they want to redeem it. If they don’t like this current bundle and would prefer, say, a romance or a sci-fi bundle, they can wait until a bundle they like comes up and redeem it then. Best of all, all gift cards are bonus-enabled, so the gift recipient won’t miss out on any books in the bundle. Timed delivery is available for both gift cards and regular gifts. 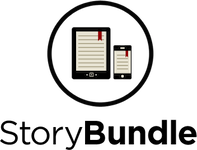 This allows you to control exactly when your recipient will get the gift of StoryBundle. Want it to arrive exactly on Christmas, their birthday, or specifically for the fourth day of Hanukkah? Fill out a future date and time at checkout and we will deliver your gift right when you specify. Get quality reads: We’ve chosen works from excellent indie authors to bundle together in one convenient package. Pay what you want: You decide how much six fantastic indie books are worth to you. If you can only spare a little, that’s fine! You’ll still get access to six thrilling titles. Support indie authors: StoryBundle is a platform for indie authors to get exposure for their works, both for the titles featured in the bundle and for the rest of their catalog. Plus, when you’re supporting indie authors you’re supporting the little guy or gal. Give to worthy causes: Bundle buyers have a chance to donate a portion of their proceeds to charity. We’re currently featuring Mighty Writers and Trees for the Future. Receive extra books: If you beat our bonus price, you’re not just getting six books, you’re getting eight.